When they were suppressed in 1307 the Abbey's rights were taken over by King Edward II who granted them to various relatives. The Building you see today it is pretty much the way it was when King Henry VIII gave it to his former Queen, Anne of Cleves. Following Anne's death Bisham Abbey passed onto Sir Thomas Holby, the man who was responsible for the custody of princess Elizabeth during the reign Queen Mary Tudor. After her accession Queen Elizabeth I appointed him Ambassador to France. It is the tormented ghost of Sir Thomas Holby's wife, Dame Elizabeth, that has long reportedly haunted the Abbey. Dame Elizabeth Holby was a close friend of Elizabeth the first. She was a scholar who wrote poetry in both English and Latin, and composed various religious treaties. She was also over ambitious for her children, forever urging greater effort in their studies. She despaired of her youngest child William, whom she called a stupid child. One historian wrote that he died at an early age of a brain disease aggravated by his mothers repeated boxing of his ears. There is however another story regarding Williams death, it is generally agreed William was a slow learner. One morning Dame Elizabeth beat William particularly badly because of his studies and locked him up in the tower until his work was completed. A few moments later a message arrived asking Dame Elizabeth to come to court immediately, she left in a hurry forgetting to tell the servants where William was. She did not return until two days later, when William did not come out to greet her arrival back at the Abbey, she raced up to the tower to find her son dead. Dame Elizabeth never forgave herself and spent the rest of her life in deep regret for her actions. For over 400 years Dame Elizabeth's ghost has been reported throughout the grounds and property, dressed in mourning clothes. Her apparition is often seen washing blood from her hands in a bowl, which often floats in front of her without any visible means of support. On other occasions she has been seen she is described like a photographic negative, with a black face and hands and wearing a bright white dress. Two schoolboys claimed to have witnessed her ghost sitting in a rowing boat on the river Thames which flows at the foot of the picturesque mansions grounds, as the boys approached her apparition and the boat vanished. At the end of the 19th century Admiral Vansittart was the owner of Bisham Abbey he ridiculed any belief in the paranormal on taking up residence at the Abbey. The Admirals belief soon changed, after staying up late one night after playing chess with his brother, he had an experience that was to change his mind about the supernatural completely. He later wrote �We had finished playing and my brother had gone to bed. I was standing alone in the great hall where Dame Hoby's portrait hangs. Suddenly I felt that someone was standing behind me and I spun round, just in time to catch a glimpse of the spectral Dame. When I looked round to check her description from the portrait, the frame on the wall was empty�. 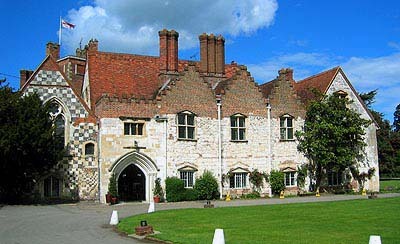 Bisham Abbey is now one of the UK's National Sports Centres. Bisham Abbey provides training grounds and centres of excellence for the country's leading sportsmen and women. It is the training venue for over 20 different sports and organisations including the English Institute of Sport, England Hockey, WIN Tennis Academy and the England Football and Rugby Associations.